Special 7-3 is the third level of Special 7 in Super Mario 3D Land. It is based off of World 7-4. The player starts out on a metallic platform, in front of some gears. 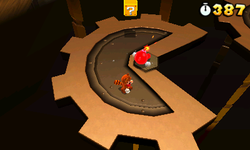 Tail Bob-ombs float down onto these gears as the player progresses. At the end of the gear section is a swinging platform that leads to some rotating platforms that leads to an area with Fuzzies. At the end of this section is a Warp Box. In the next area is the Checkpoint Flag, which is in front of a gear platform with a Magikoopa on it. These gear platforms eventually lead to some yellow rotating platforms which lead to some rotating platforms which are in front of the Goal Pole. Star Medal 1: Near the swinging platform, there are several Wooden Blocks placed together as a platform, with an Exclamation Mark Block on it, when the block is hit it will create some Platform Blocks that will lead to the Star Medal. Star Medal 2: At the end of the middle path, after the rotating platforms. Star Medal 3: On a yellow rotating platform, that is on the far right.